Review: Cole Sear is an 8 year old boy who communicates with spirits that don’t know they are dead. He seeks help from a child psychologist Dr. Malcolm Crowe. A brilliant thriller staring Bruce Willis. A very scary and chilling ghost story. The script is very well written and very intelligent. 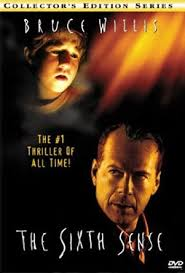 This is Bruce Willis’s best film I have seen him act in and I also thought Toni Collette is very convincing. As well as Bruce Willis’s character being very convincing it is also very believable. You believed in their characters. It is a very watchable film. The actor Haley Joel Osment had a little part in the film Forrest Gump (1994). The director actually wrote the role of Malcolm Crowe with Bruce Willis in mind. All of this film was filmed in sequence. Just some of the themes that are very much in evidence in this are Afterlife, Courage, Faith, Grief/Loss and Reconciliation. This has the most famous line in movie history, the line is “I see dead people”. Apparently at the Cannes Film Festival in 2003 it won the DVD Design Award (Tied with Captain Conan,1996).